Our fresh Cynomolgus (Monkey) hepatocytes are of highest quality. The level of quality insurance is identical with human hepatocytes. Typically we offer highest viability and functionality levels. In combination with appropriate cell morphology, our cell technology is one instrument for adequate in vitro - in vivo correlations for your purposes. 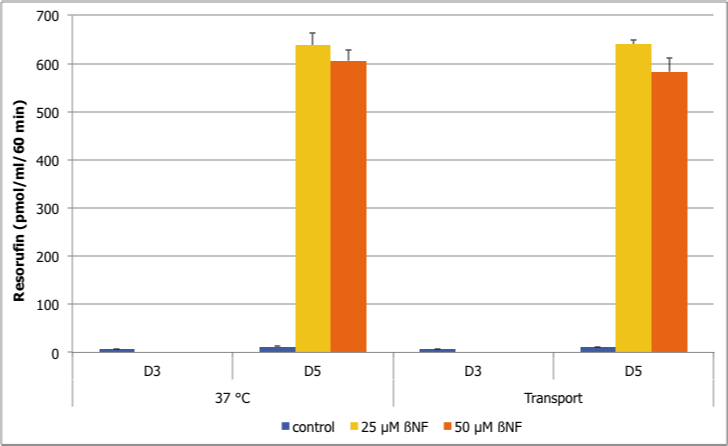 Characterization methods of fresh animal hepatocytes include the monitoring of liver specific functions, activities of drug transporters and the induction of cytochrome P450 activities. We also monitor and document cell morphology, attachment efficiency, monolayer confluency for platable cells and viability stability over time. Cynomolgus Monkey hepatocytes are available in suspension and in multi-well plates (6-, 12-, 24-, 48- and 96-well plate). Products in SuspensionSuspensions will be sent on crushed ice on the day of isolation and should be used on the day of receipt. Included with each suspension order are following documents: Animal demographics (Rat) as datasheet, instructions for recovery of cells. Although hepatocytes in suspension are normally platable within 20-24 hours after isolation, we do not guarantee the platability of these cells, and recommend to order plated hepatocytes if this is the intended use. Plated ProductsPlated products will be sent at ambient temperature on day 1 after isolation and should be stored at 37°C with 95% humidity and 5% CO2 atmosphere. Included with each plated order are following documents: Animal Demographics (Rat), datasheet (with microscopic images of cells prior to shipping), manual for culture of primary hepatocytes. Biohazard warning: Tissue fractions such as hepatocytes should be considered as potentially biohazardous, and should be treated as biohazards in the laboratory. Only for research purposes. Not for use in human diagnostics or therapeutics. It is recommended to culture Rat hepatocytes on collagen coated culture plates in HHMM (Human Hepatocyte Maintenance Medium), a serum-free culture medium containing Hepatocyte Growth Factor and Epidermal Growth Factor. Cells in plates require light protected storage at 37 ℃ and 5 % CO2 . It is recommended to culture Cynomolgus hepatocytes on collagen coated culture plates in HHMM (Human Hepatocyte Maintenance Medium), a serum-free culture medium containing Hepatocyte Growth Factor and Epidermal Growth Factor. Hepatocyte specific morphology and functions like cytochrome P450 protein activities are maintained and/or remain inducible under these culture conditions (Fig. 1 and 2). 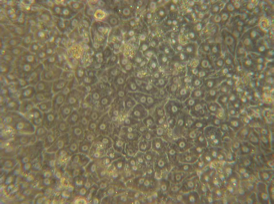 Fig 1: Cynomolgus hepatocytes at day 5 cultured with HHMM. The liver fulfills many vital processes in mammals. It is the central organ of energy metabolism (glycolysis, gluconeogenesis, lipid metabolism, amino acid metabolism, and ureagenesis), responsible for the maintenance of the blood sugar level and the synthesis of plasma proteins under physiological and patho-physiological conditions. Hepatocytes are the most prominent cells within the liver. Hepatocytes eliminate toxic substances from the blood. In this biotransformation process transporter proteins (influx and efflux transporter), phase I reaction (cytochrome P450 proteins), phase II reactions (mainly glucuronidation and sulfatation) play a central role. Primary hepatocytes are perfectly suited for in vitro metabolism and toxicity / detoxification studies prior to preclinical or clinical tests. Propagation of hepatocytes for cell transplantation, three dimensional culture systems and culture in bio-artificial liver support devices is now under investigation. Monkey hepatocytes (Cynomolgus) are isolated from livers obtained from male or female Cynomolgus and are available fresh as suspensions or in various culture formats (6, 12, 24 and 96well). Special configurations are available on request. Donor demographics stating vaccination status and health status of the animals are available for each animal. cultured for 48 hours in the presence of 50 μM ß-NF.